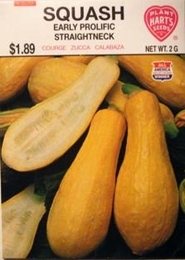 This variety of summer squash is very popular, easy to grow and fast maturing, producing a generous crop of delicious and delicately flavored fruits. Plants are compact bush type bearing straight, tapered, bright yellow fruit that is delicious baked, steamed fried, boiled or served raw. Squash freezes well. Pick fruits before they mature and the plant will continue to produce more vitamin rich fruit until frost.